These high-protein maple cider pork chops deliver restaurant-worthy flavor right at home. Sweet and salty pork chops are irresistible, and this healthy Paleo recipe brings it all to the table in under 30 minutes! Using only one pan and eight simple ingredients—this no-hassle dinner is perfect for chilly weeknights. Pork is high in protein and a great alternative to chicken. For this recipe, we recommend bone-in pork chops, which are more flavorful than boneless. 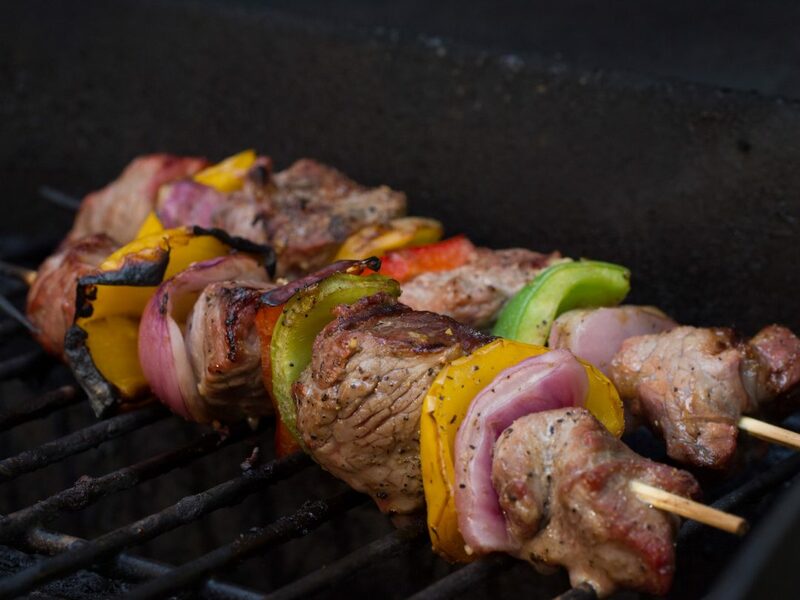 If you choose to use boneless chops for this recipe, however, reduce the cooking time by about two minutes, depending on thickness. The flavor of this recipe starts right in the first step by searing the chops in grass-fed ghee. This high smoke-point fat is ideal for adding a caramelized texture to meat because it doesn’t easily burn and imparts a super-buttery flavor. Use it in place of butter any time you’re working with high heat. The sweet maple sauce is made right in the pan as the chops cook. Gut-boosting apple cider vinegar adds tang, while simple herbs like garlic and fresh thyme infuse in the sauce with deep savory flavor and aroma. After the ingredients for the sauce are added, reduce the temperature to a simmer. This allows the flavors to marry while the pork finishes cooking. Be sure to spoon the sauce over the chops periodically to keep them nice and moist. 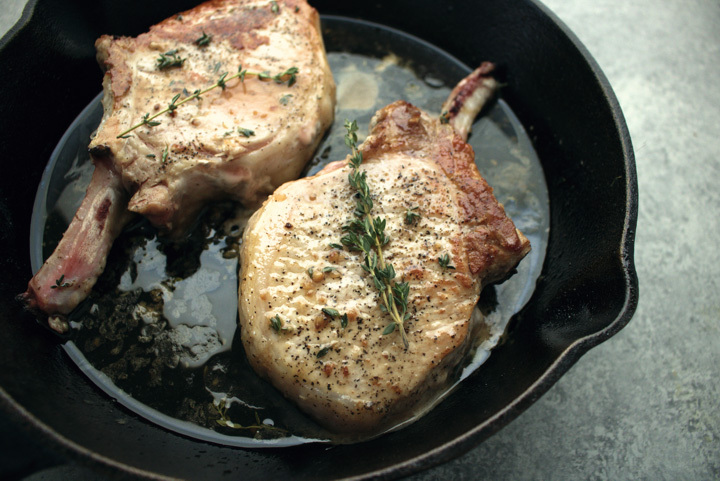 Remove the pork chops from the pan and let them rest five minutes before digging in! Heat ghee over medium heat in a cast iron skillet for three minutes. Meanwhile, blot the pork chops dry with a paper towel and season with salt and pepper. Add the pork chops to the skillet and sear for six minutes. Flip the chops and add garlic to pan. Cook for one minute, then reduce heat to medium-low. Add the maple syrup, apple cider vinegar and thyme to skillet and cook for eight minutes longer, or until chops are fully cooked. Occasionally spoon the maple syrup mixture from the pan onto the pork chops. Remove from heat and allow the pork chops to rest for five minutes before serving.